Get your wallets ready (to stay inside your pockets!). and you save 20%. I did! Since I’m someone inclined to procrastinate, it actually feels good to get this out of the way. You gotta cover Mom, you know. This promotion was a good incentive. If you have a Bank of America ATM card or credit card, you can gain free admission to participating museums for you and one guest. See here for participating museums. This is for the entire month of May. The museums are nation-wide; however, non-coastal areas of the country are neglected unfortunately. I’ll be dragging someone to The Huntington Library, Art Collections and Botanical Gardens in San Marino, at the very least! Interesting to note, adult admission is typically $15. Last time I was there was with my parents, when I remember it being absolutely beautiful–so it would be good to see what they have now. The annual book festival held by The Los Angeles Times is this weekend. As usual, it will be held on the UCLA Campus, Westwood. This is one of the fond events I remember having to work as an employee of the UCLA Central Ticket Office back in the dog days of collete. Be sure to look at the panel and reading schedules to see if your favorite author will be holding a panel or doing a reading, especially if he/she has just published a book. Also, if you’re a failed pleasure-reader like me, it’s still fun to walk around to the different booths to brouse the diverse variety of books on desplay. Lots of free stuff and random food, too! A tequila connoisseur? Why not celebrate Cinco de Mayo one week early and beat the rush? On Saturday, April 28: El Carmen on 6th Street will be holding a Tequila Tasting, showcasing a dozen different varieties of tequilas and passing appetizers to boot. 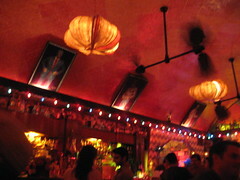 Stare at the Luchadore paintings above. Honestly, I don’t know how how much use I will get out of my flat admission since I don’t particularly have the tongue for tequila, but the idea was just too interesting to pass up. This entry was posted in Deals, Events, Mid-City West, Pasadena, West L.A.. Bookmark the permalink.